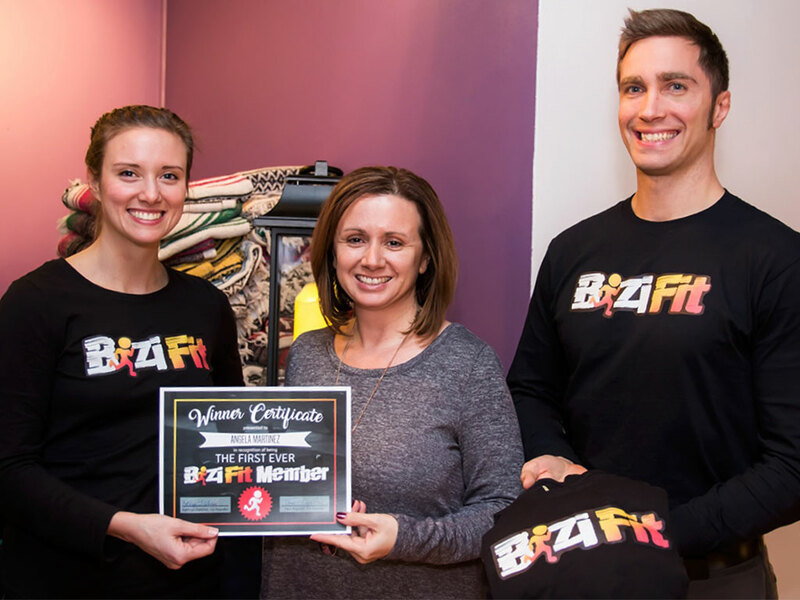 The co-Founders of BiziFit, Kathryn Fletcher and Paul Kopalek, gathered with their local fitness partners on Friday, December 9, 2016 at Binghamton Zen Den, to award Angela Martinez, the winner of their Pre-launch Giveaway, with the FIRST BiziFit Membership and announce details about the new multi-site fitness memberships offered by their Binghamton-based company. BiziFit was formed shortly after Fletcher and Kopalek, a husband and wife team currently residing in Downtown Binghamton, asked each other why there couldn’t be one membership that would give them access to multiple gyms, yoga classes, and group workouts offered at various local fitness facilities. While BiziFit’s concept is entirely new to the Southern Tier, some of its core features are similar to models that have recently become popular in larger cities like Philadelphia, Boston, and New York City. This month, we’re excited to launch with eleven gyms and studios (Bizi Sites) that offer yoga, Pilates, CrossFit, 5K races, 24-hour gym access, and group fitness classes in Binghamton, Johnson City, Endicott, Endwell, and Vestal. The first eleven official Bizi Sites include: Binghamton Fit Body Boot Camp, Binghamton Zen Den, The Body Lab Pilates Studio, CrossFit Sona, GasLamp Gym, Ironworks Gym, JAM Fitness, The Pilates Salon, Southern Tier CrossFit, TRYoga, and the Vestal Coal House. We started releasing memberships this week to the fitness enthusiasts who signed up for their early-bird VIP List and will be opening to the public very soon! In the meantime, everyone is invited to participate in the BiziFit New Year’s Challenge, (now through January 31, 2017) a photo scavenger hunt that rewards participants for visiting local parks and fitness venues across the Greater Binghamton community. PrevPreviousThe Body Lab Pilates Studio Teams Up with BiziFit!